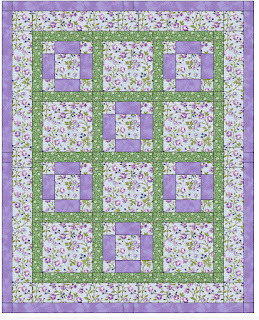 Quilt 54: Civil War Charm Squares - DONE! 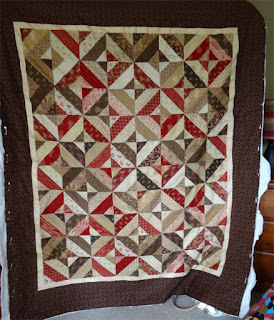 Last year I made a quilt for a friend using charm square packs made of Civil War print reproductions. It turned out great, and I really wanted to do another, this time in a size suitable for a man (ie: long enough to wrap under his feet, but still extend up to the chin). The original quilt was 8 squares across and 11 squares high - giving an overall dimension of 48" x 61". 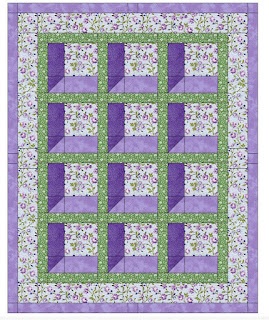 A nice size, but just adjusting to 13 squares high would make it more practical for a man. I pulled out the design for that first Civil War quilt and just added 2 more rows, and sure enough - the dimensions turned out to be 48" x 70.5". PERFECT! 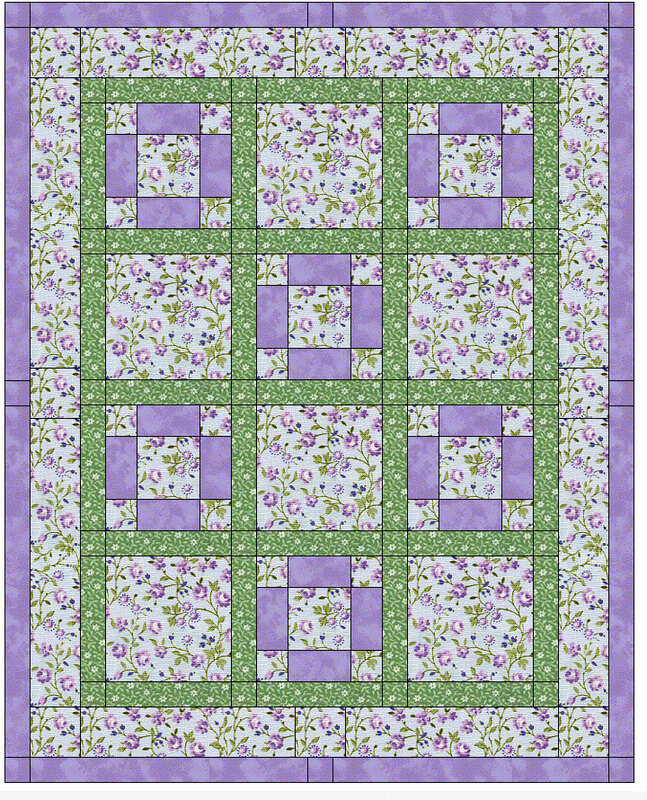 I'm just loving charm square quilts, as they whip together in no time at all - and that was certainly the case with this one. 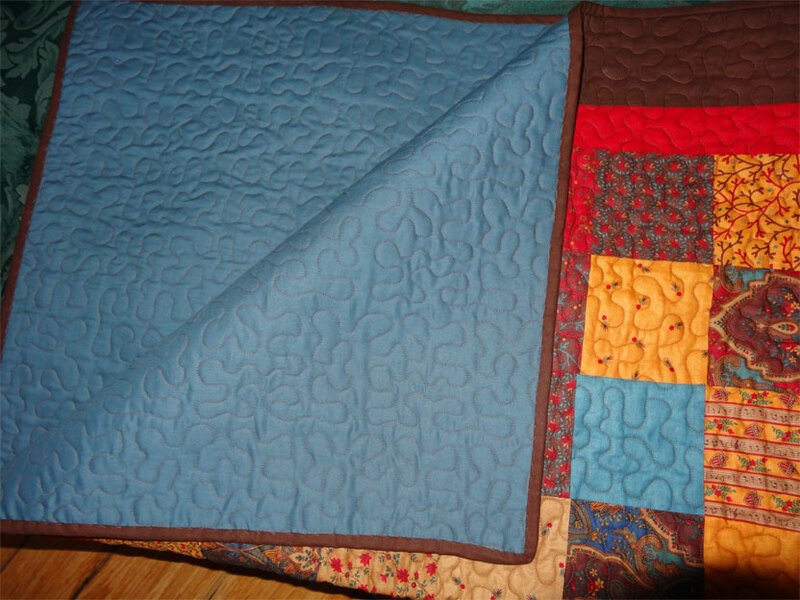 Here it is - all quilted and bound, ready to go to it's new owner. And here's the backing - I love the chocolate thread on top of the federal blue backing! 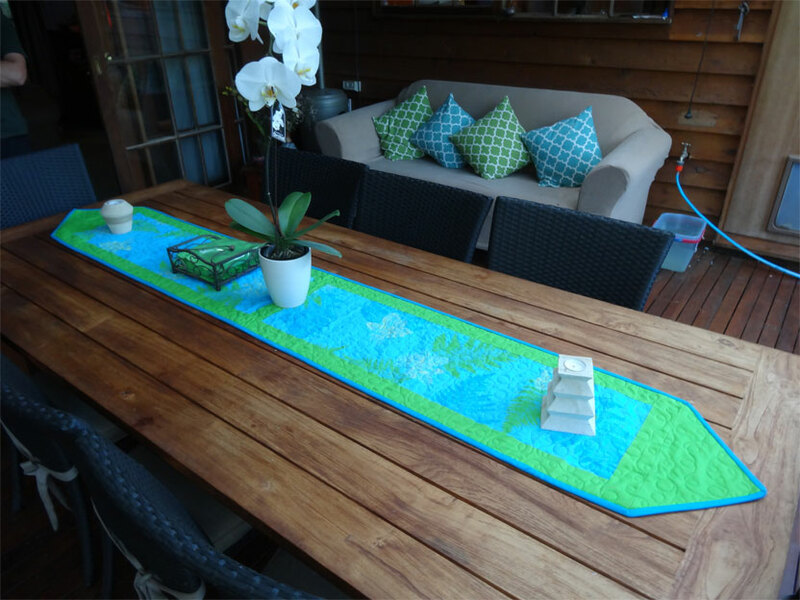 She wanted a 95" long table runner - and there was just enough of the Hawaiian print left to do that, providing I cut the print into only a very few pieces (the more pieces in a quilt, the more fabric you need because you lose 1/2" every time you have a seam). I thought about this project for a while, and decided to simply cut out two large rectangles, making the bulk of the top. This would eliminate waste but also would prevent having the large print cut up too much. My friend asked for triangle ends instead of squared off - and that's what I did. 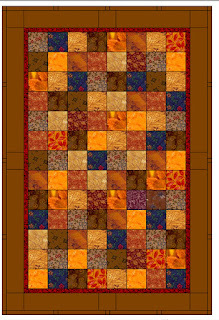 Unfortunately I haven't figured out how to model that in my quilting software, so you'll have to use your imagination. 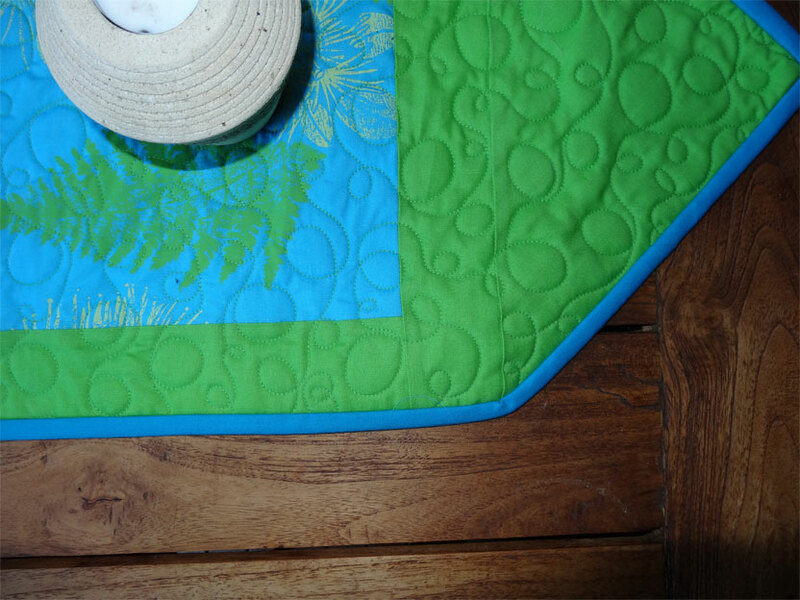 Anna had opted for lime green thread for her quilt, but in the time since completing that project, I'd done another using a variegated turquoise - and hmmm... That variegated thread might really play nicely on the print. 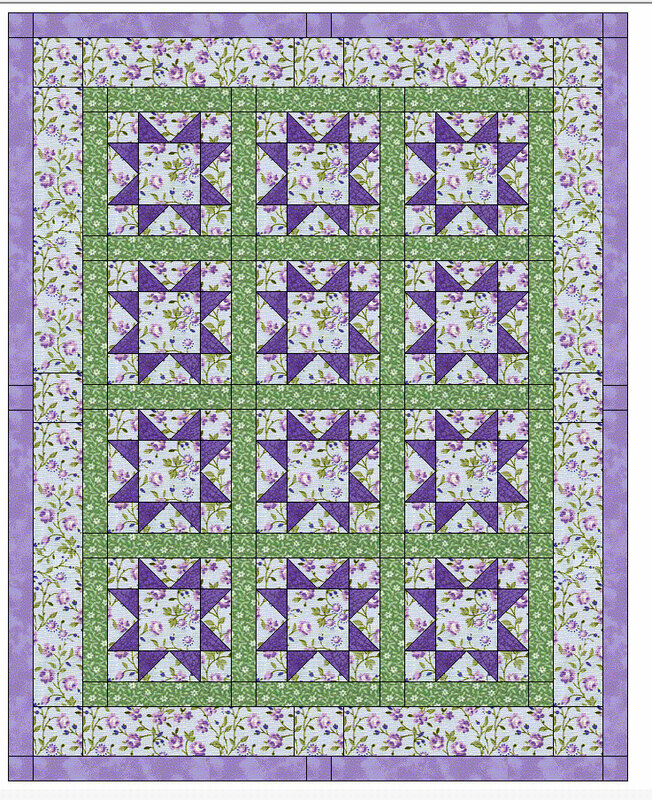 But, having learned my lesson on Anna's Sawtooth Star Poppies quilt, I "auditioned" both threads (which basically means piling up a couple of meters of thread on the print in question). Doing that, I liked the blue, but the green was a clear winner. 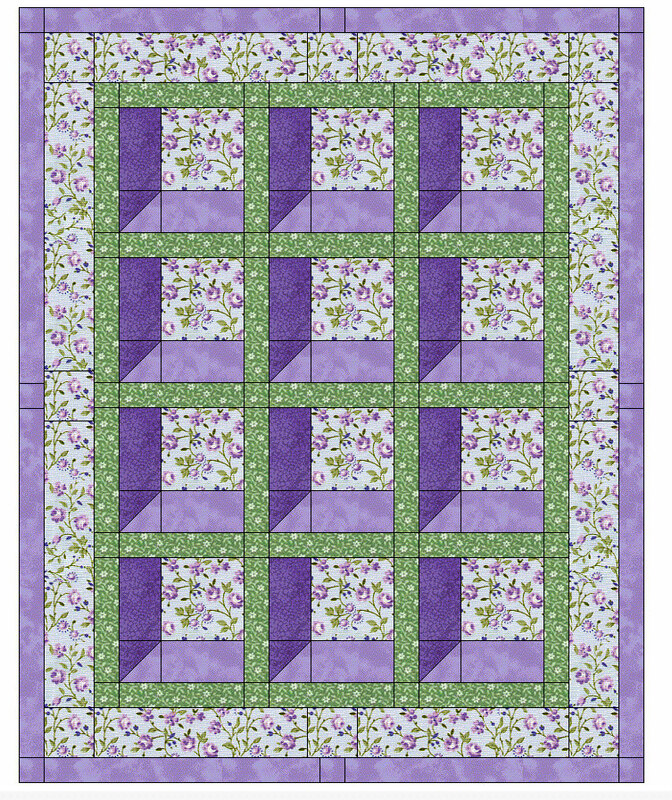 Because this quilt is basically 2 large rectangles with a 2" sashing strip and 2" borders (and triangles on the ends), it whipped up in no time! I opted to do free-motion loop-d-loops as the stitching pattern. 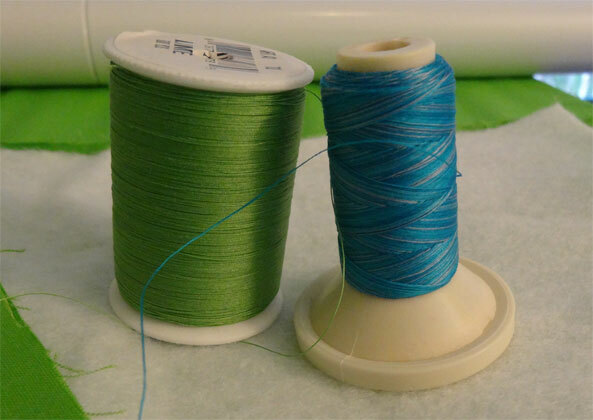 As you can see (below) the green thread pretty much disappears into the quilt, and the stitching really is only prominent with strong side-lighting. For the binding, I had a scrap of dark turquoise solid homespun (same type of fabric as the green edging). 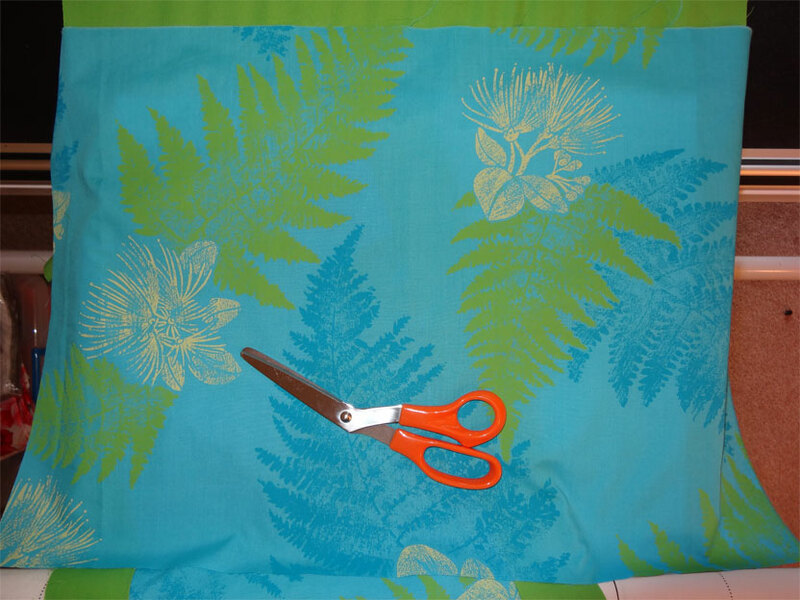 It didn't EXACTLY match the darker fern leaves, but was close enough, and because it doesn't actually sit right up against the leaves, your eye accepts the binding as matching the ferns. Table runners are a great "fast" project. I'm hoping to many more of them! Sharon's First Project - and my epic "fail"
How's that for a "beginner project"? I didn't measure it, but I'd say it's roughly 50" x 60". 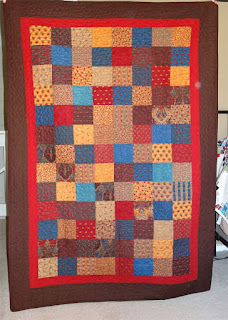 And oh, it's beautifully pieced. I was totally blown away when I saw it. Sharon, very humbly, said, "well, I just followed the instructions". Right. Well, folks, there's more happening here than just following the instructions. I can think of a million and one ways someone could mess up a design like that - but not Sharon! Just look at how evenly the prints are distributed, everything set with obvious care and an instinct for the total design. I didn't get any closeups of the blocks - should have. They're beautifully pieced. Then she showed me a photo on her mobile of "project number 2" - and WOW! Even more complex than this one! Well - I don't know where I put my brains. 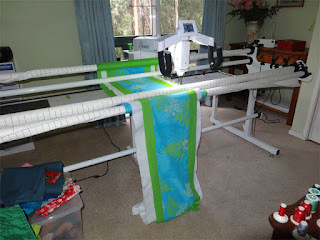 I had noted that my longarm has stitch settings of 1", 2", and 4". And I thought - hey! Baste at 4" and it'll be so easy to pull out at the end. Yup. Very easy. Way too easy. So we did it. I say "we" because Sharon had fun driving the longarm - but what happened is all my fault. 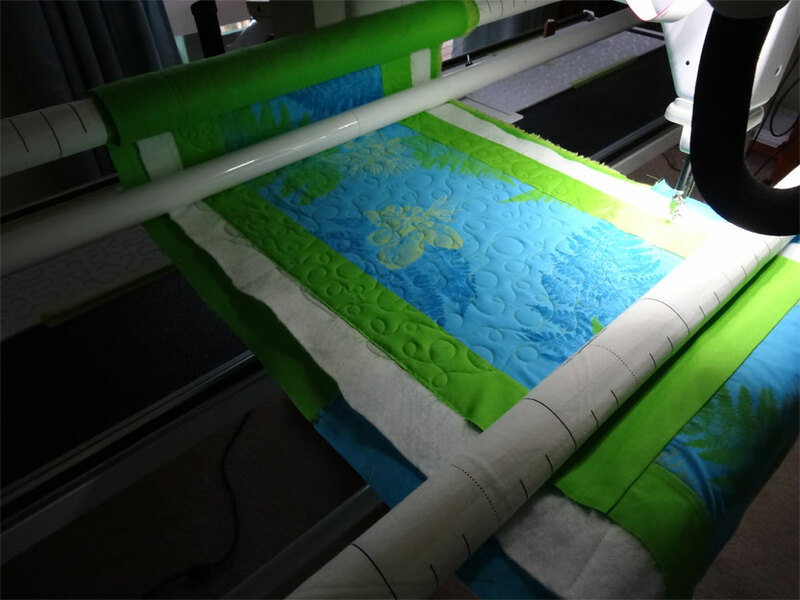 We basted the quilt sandwich using the 4" stitch and it wasn't until we were pulling it off the longarm that I realized what I'd done. As I was taking it off, my hand caught one of those 4" sitches and PULLED! NoooOOOoooOOOOO!!!! (Actually... what I said at that moment I won't repeat here in polite company - just suffice it to say I'm sure my parrot heard me and pressed "record" and I'm going to be VERY sorry for my outburst). The basting should have been done at half-inch intervals, not 4 inches. With half-inch intervals the stitches wouldn't be so easy to catch. 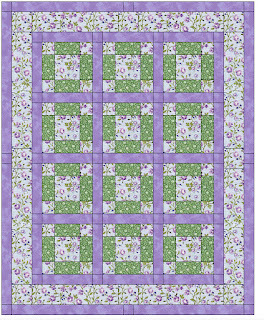 Four inches is just way too long - and it's probably going to make the handquilting work MUCH more difficult. Oh... I'm just sick. I suggested to Sharon that we pin it and pull out the basting, but she's keen to give it a go anyway. 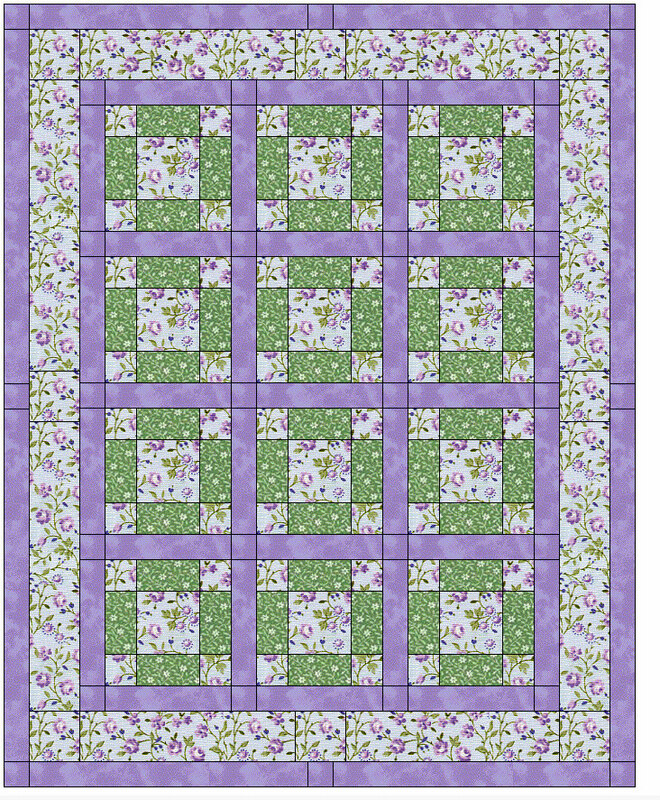 And, for my part, I'm going to put together something for hand-quilting and will longarm baste it with half-inch stitches and see if it works as I think it should. A couple of weeks ago my friend Simone commissioned me to make a quilt for her eleven year old daughter Asta. I was hoping she would as, and was delighted when she did. Asta is a lovely little girl and it just pleases me to no end to make something for her. I emailed the designs to Simone and asked her to let me know which one Asta liked best. She quickly got back to me, saying Asta liked "Number 2". What neither of us realized, however, is that Simone's mobile (which she used to view the email) apparently displayed the images in a different order than I was seeing. 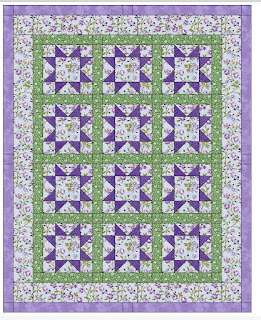 To me, the Ohio Star quilt was "Number 2", but that wasn't the one Asta wanted. We'd agreed to take Asta to the fabric shop and let her pick out the fabric she wanted for the quilt. I arrived at Simone's house with a print of the Ohio Star quilt and yardage estimates. Asta glanced at the sheet and said "That's not the right one!" We sorted it out and I ran home to have the correct quilt printed and get the yardage estimates from the design software. This delayed us setting out by about half an hour, but that didn't matter - with the correct design in hand, we headed happily to the shop. 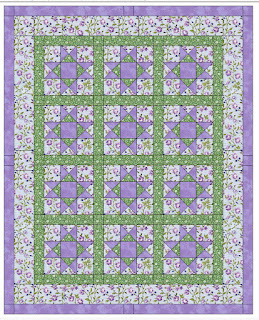 "Patchwork with Gail B" is where we went. They've got thousands of bolts of fabric - literally thousands! Asta indicated an interest in butterflies, so one of the clerks pointed us to where the butterfly prints were displayed. I'd say there were easily 60 different butterfly prints. Poor Asta was overwhelmed by the choices, but did find one she was fairly sure about after about half an hour of studying the options. Then she was distracted by a ladybug print which, unfortunately, just wouldn't marry up with the butterflies she selected. Butterflies won over ladybugs, so we moved on to try and find something that would go well with the butterfly print. Another half hour or so later, the butterflies were overthrown in favor of a pairing involving two prints - one turquoise/white swirls, the other hot pink flowers. We needed a third fabric for the design, but Asta was showing signs of fabric fatigue. There's only so much you can expect of a lady of 11 years. It was getting to be too much. I suggested we simplify and get a solid to go with the prints she'd selected - so we headed to the wall where all the plain fabrics are displayed together. Hanging on that wall was a display model for one of Gail B's many kits. 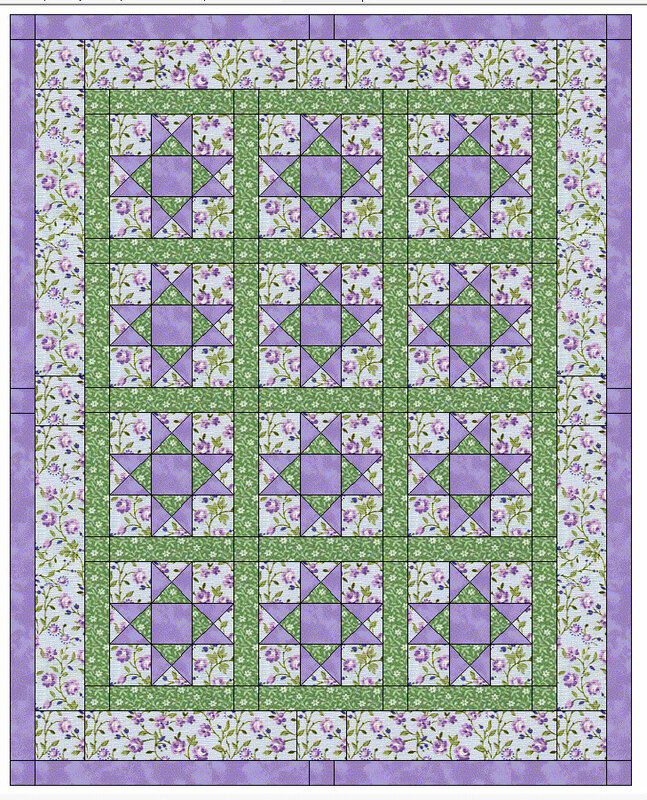 The design, called Strawberries and Cream, combines simple squares with elongated "Snowball" blocks - all in bright fruity pinks and whites. Asta was immediately drawn to it, and it was plain to see that she'd fallen in love. So back to the shelf went the turquoise and hot pink prints, and one of the clerks fetched a kit for us from the store room. "Too easy!" I smiled, "All we have to do now is get backing fabric." A look of sheer panic came over Asta's face. "Do I have to pick anything out?" she asked in a quiet but distressed tone. "Nope!" I answered, noting the immediate relief washing over Asta's flushed cheeks. I quickly located a bolt of fabric matching the backing on the display quilt and we were on our way home in no time. Asta had a "date" with a playmate down the street from her house and Simone dropped her off there. After Asta was out of the car, Simone made me laugh by saying, "I have to warn you, when you bring the finished quilt she's likely to say there's too much pink in it."